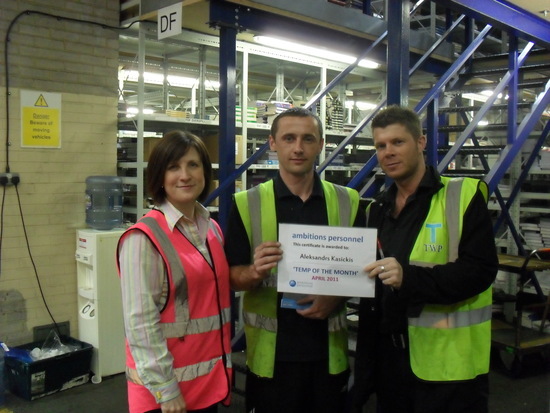 April’s Temp of the Month Award goes to Aleksis Kasickis from Grantham. Aleksis has worked for Ambitions Personnel since August 2008 demonstrating an exemplary attendence record and work ethic – he has never had a day off sick! Nominated for the award by consultant Michaela McGorty, who describes him as the ‘dream temp’! Our client have also given excellent reports of his work performance, where his picking rate and accuracy regularly surpasses all other team members! Pictured is Aleksis recieving his award of high street vouchers and chocolates, presented by Michaela.